This much Russia knows: the chilly, early days of spring go hand-in-hand with cabbage. Throughout the countryside, rows of cabbages can be found poking through the ground even as the last freeze thaws. 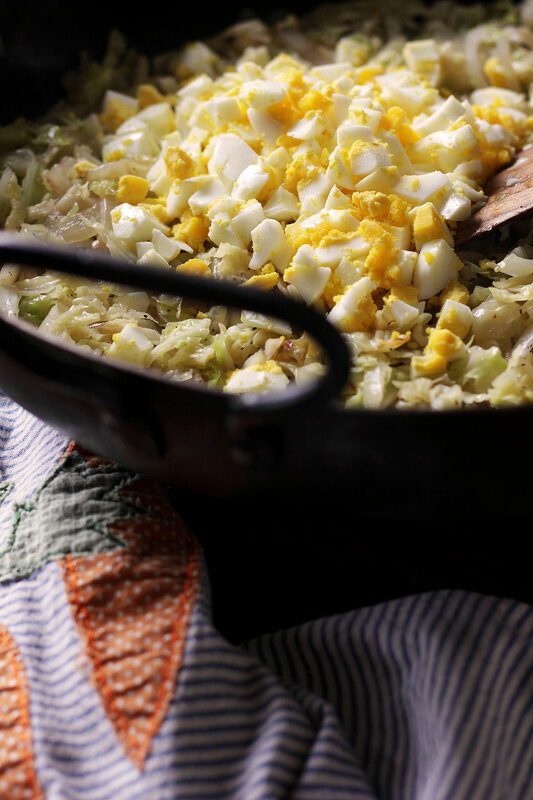 The tough, squeaky heads are impenetrable to all but the peskiest of creatures, but give them some attention with a sharp knife and persistent flame and you’ll see why cabbage is the pride of Russian home cooking. 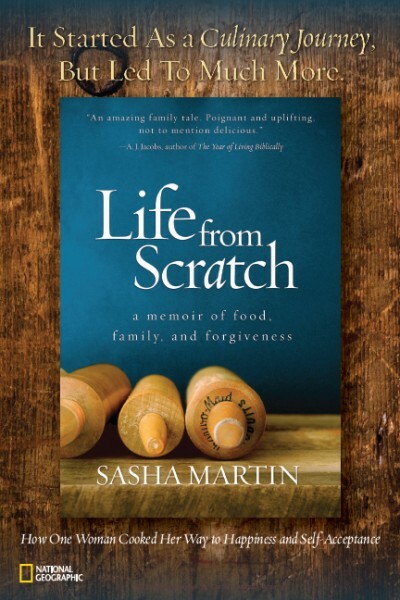 From cabbage rolls to borscht, Russian cookbooks are fat with ideas to use up the spring harvest – and at a mere $2-$3 per head at the market, it’s tempting to attempt them all. 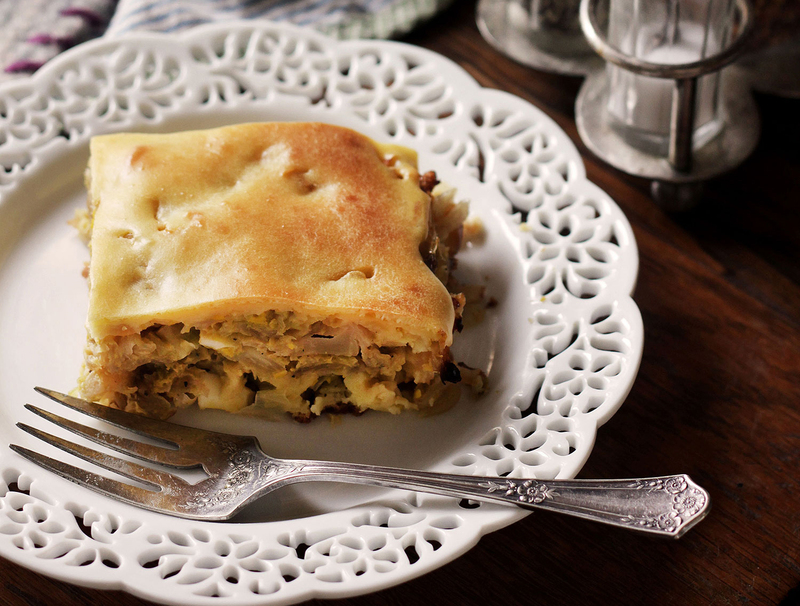 But if I had to pick just one, cabbage pie seems to shows off the humble vegetable’s truest potential. Cabbage. 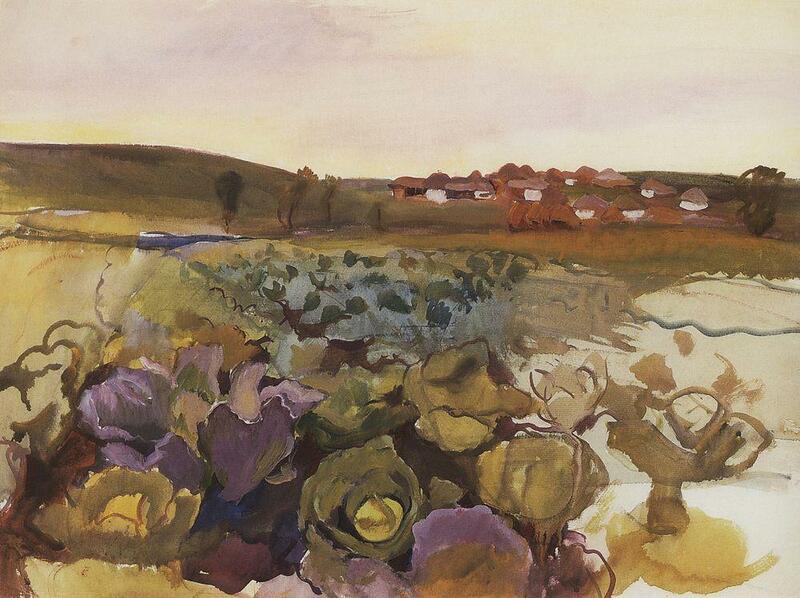 Village Neskuchnoy (1909). Painted by Zinaida Serebriakova (1884-1967), one of Russia’s great female artists, known in part for her depictions of the Russian countryside. … second, season generously with salt and pepper (a little extra pepper adds welcome bite). Think of this way: scrambled eggs without a good shake of salt and pepper are terrible. 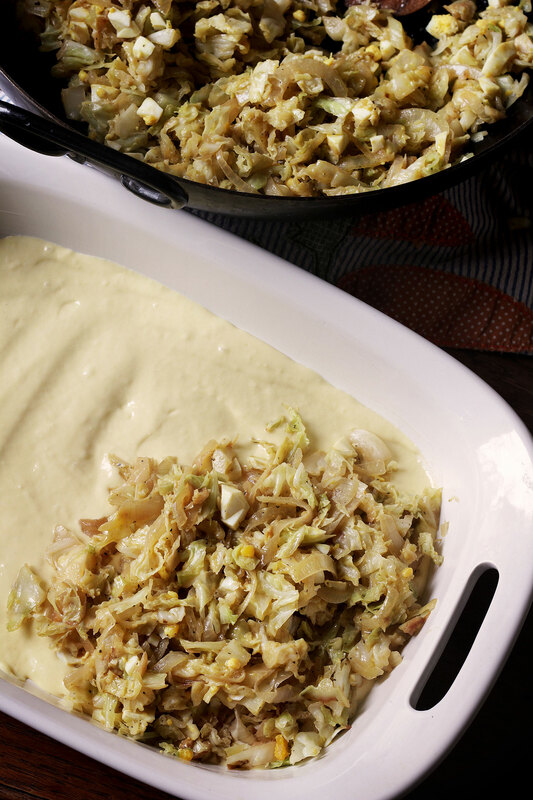 The same goes with cabbage pie, especially since there’s a few hard-boiled eggs in the mix. Spread a little batter on the bottom of the pan, add the filling, and then spoon the remaining batter on top. Use the back of a spoon or spatula to spread evenly across the top. The coating might seem sparse but it puffs as it bakes and turns out to be just right. Wait a few minutes before slicing – the pie holds together better that way. Enjoy on a chilly spring day – warm or at room temperature. Remember – there’s great joy in sharing a table with your loved ones. Take the time to make your meals into adventures… into memories worth reliving. 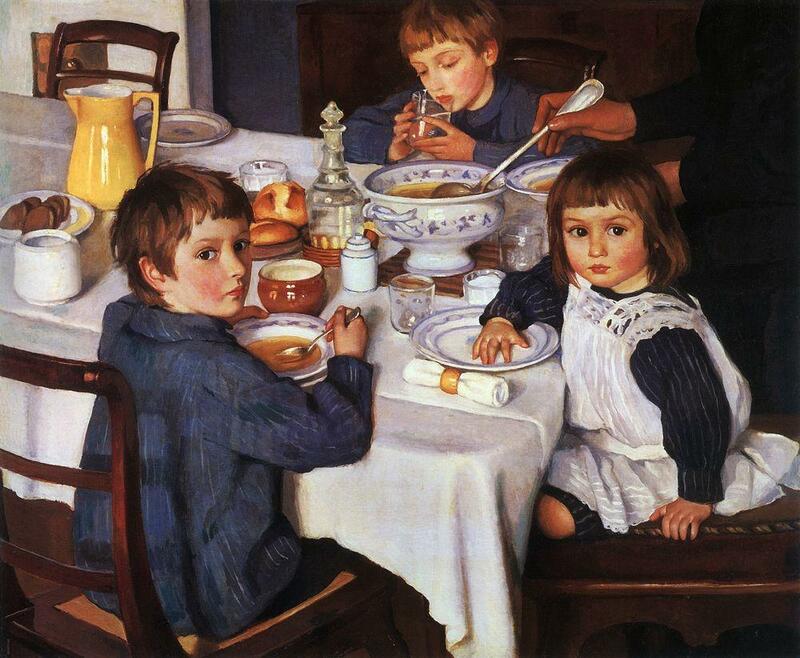 “At Breakfast” (1914) by Russian painter Zinaida Serebryakova. 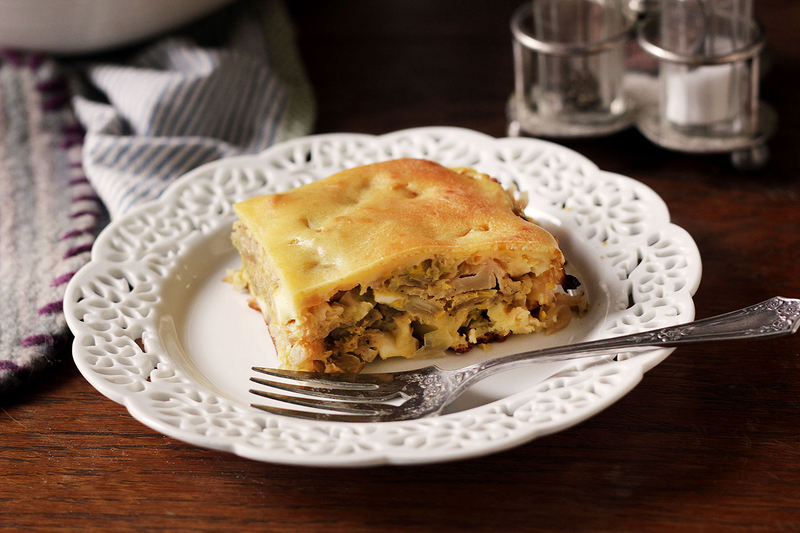 Russian Cabbage pie is a casserole worthy of any potluck. Take the time to wilt the cabbage down fully and season well for best results. 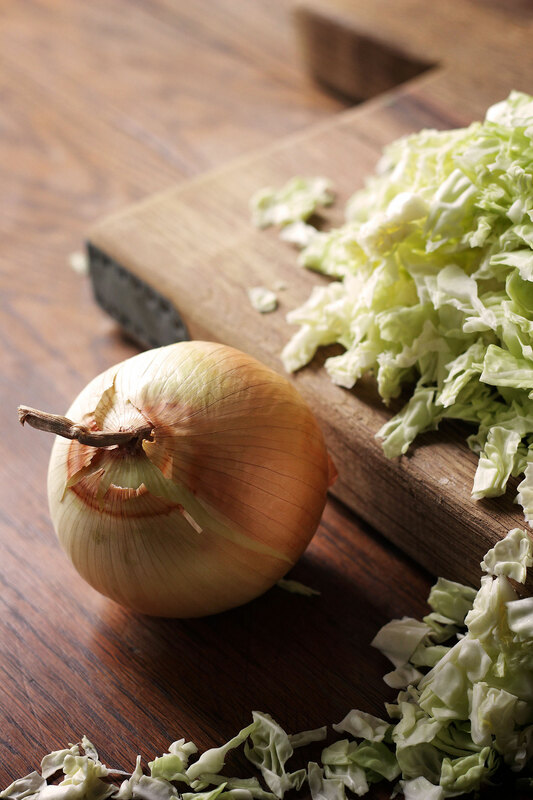 Cook the cabbage and onion in butter over medium-high until softened. A large wok works best. Season the cabbage with salt and pepper as you work (if it's bland now, it'll be bland later!). The wilting process takes about 20 minutes. You may need to reduce the heat as you go to prevent burning. Stir occasionally. Set the hot mixture aside to cool. Meanwhile preheat the oven to 375F and grease an 11x9-inch baking dish. Once the filling has cooled to luke-warm, stir in the chopped hard-boiled eggs and the raw egg to bind. 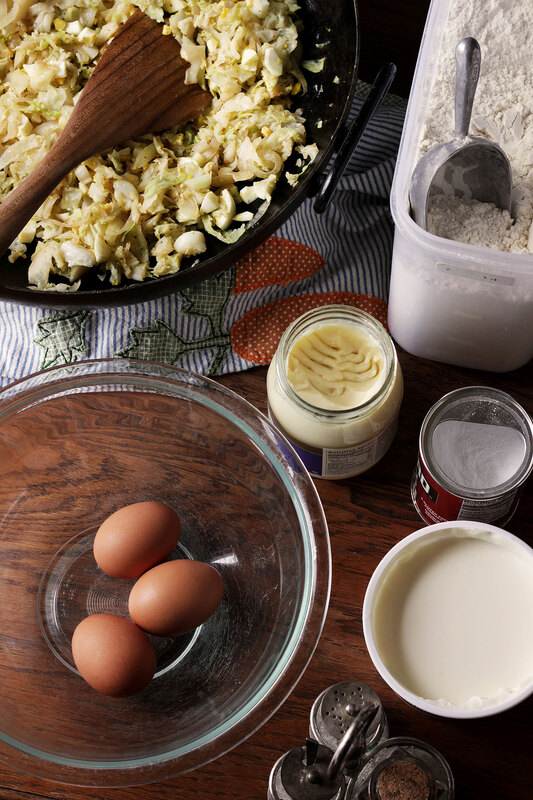 Add the eggs, sour cream, and mayonnaise to a medium bowl. Stir until smooth, then add the dry ingredients. Spread a little less than half the batter evenly over the bottom of the prepared baking dish. Spoon on the filling. Top the casserole with the remaining batter, adding it in dollops evenly across the surface and smoothing it with the back of a spoon or spatula to cover the entire surface. Bake for 45 minutes, until the crust is golden brown and shiny. Let cool at least 15 minutes before slicing so that it holds its shape. Serve room temperature or warm. It'd be lovely with a bit of sour cream on the side. That sound GOOD! One is always hearing how bland Russian food is. But when I ask the one so stating if they have ever had Russian food, the answer is 99% “no”. When I was visiting in Russia, I found the meals to be incredible. I made this as a side dish for dinner tonight. My husband & I both loved it. So easy to make, too. 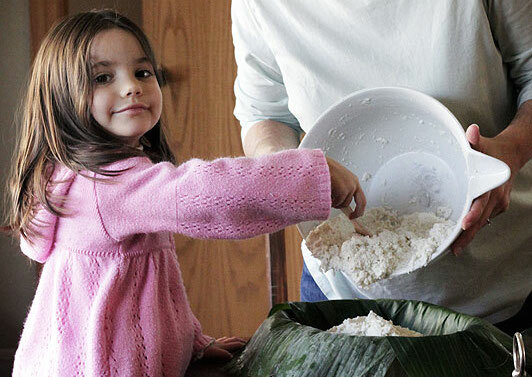 Will definitely make it again–maybe pair it with corned beef for a twist on the traditional St. Patrick’s Day meal. I served it with almost-Skoudehkaris using your recipe. (I say “almost” because I made it once before & my husband didn’t care for the lamb at all, so this time I used stewing beef instead & added some salt since beef isn’t as strong a flavor as lamb. This time he practically licked the plate clean). 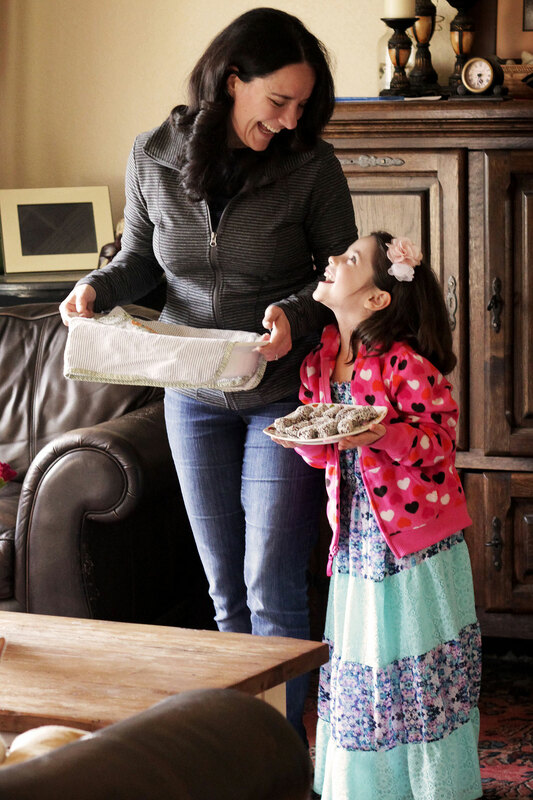 I’m thrilled to have found your website & look forward to trying many more of your recipes. I dated a Ukranian girl back in the mid-80’s. Her father was an excellent cook. 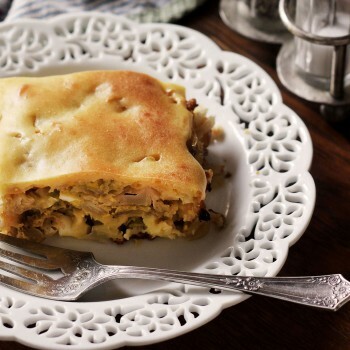 His cabbage pie – baked in a round pie pan – was msopt excellent! Sweet and full of flavor. 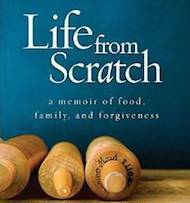 My mother’s father was from Ukraine, and she taught me many ethnic dishes. 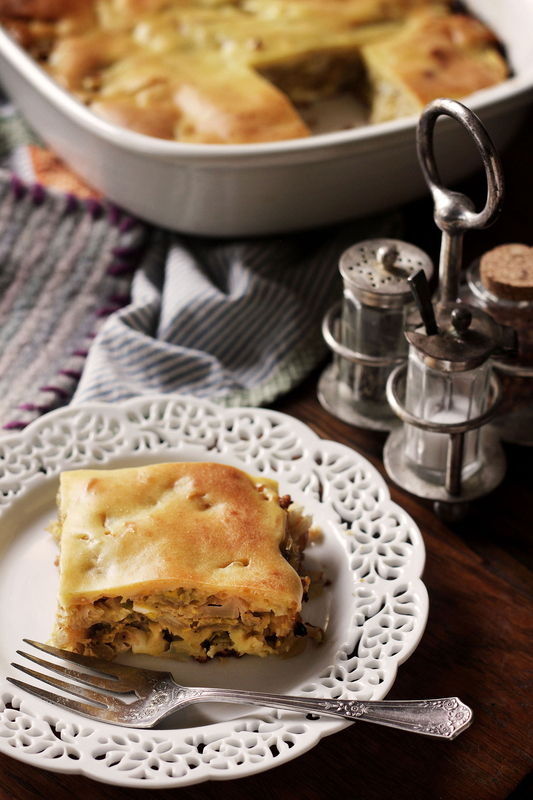 This is identical to Mark Bittman’s recipe, which l have made for many years. Delicious, and doubles beautifully when l have my Christmas party every year. I was not too enthused about the idea of eggs and cabbage together but I am intrigued wit the crust. Could this be used successfully with other pot pie fillings? Indeed, we make this pie here in Russia. But normally we use kefir (yogurt) instead of mayonnaise (apprx 2 cups), whip eggs before add them into batter and add ) 0.5 p0under of butter & 2 table spoons of sugar. Many thanks for an interesting, tasty and beautiful site! Very nice to see recipes of Russian cuisine! I bake a “kulebyaka” with cabbage from a yeast dough. I had never heard of a sour cream batter before but I think it’s going to become a staple now. It was so easy to make and turned out perfectly – my Russian boyfriend was happy. Lovely recipe. Thank you. I love trying new recipes from other countries. Put a little dill in it. I’m slightly obsessed with this dish and I love this recipe. I’m going to try kefir instead of mayo in the batter. I agree with the dill comment, this is the first pie of recipe I have found that doesn’t have dill in it! A staple for many Russian recipes!